How many photo’s do you have of yourself? I know right? Unless you have a friend or partner who shares your enthusiasm for photography you’re likely to spend all your time behind the camera and hardly ever feature. Needless to say I was a bundle of nervous excitement as we pulled up to the meeting point. The photographer happened to be L’s best friend which helped to still the nerves and soon we were having a wonderful time. Now all that’s left is to attempt to muster up some patience as we wait for the photo’s. 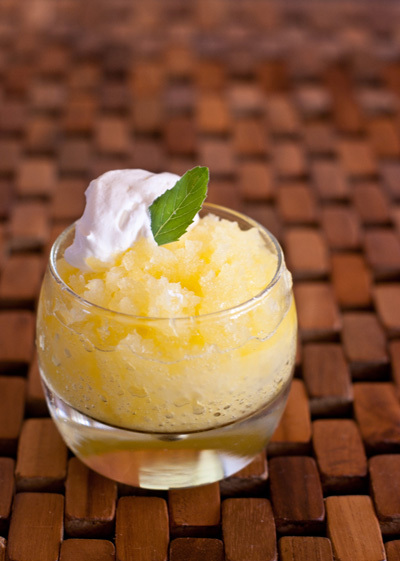 How does all this link to our Pineapple & Lemon Granita we’re enjoying today? Well, it doesn’t really. I just wanted to tell you about it. And eat some Granita at the same time. What I love about granita is that it’s light (even with the cream). Perfect for Summer. Place all ingredients into a blender/food processor and blend until smooth. Pass the mixture through a strainer to remove the pulp. Pour the mixture into a large flat pan and freeze. After about an hour, remove from the freezer and scrape the frozen mixture with a fork to break it up. Start at the edges and scrape towards the center, breaking up big chunks and forming tiny ice crystals. Freeze for about 1/2 an hour and scrape again. Do this 2 – 3 more times until you have tiny ice crystals all throughout. Great photo, Robs! Tasted yummy too! ditto the above. anyone whose mom comments has my vote, but it is a nice pic. I just found your blog via pinterst. I am a new follower. How lovely – such clean, crisp flavours! As soon as the weather warms up a little round here (bloody freezing at the moment again!) I am making this! This sounds delicious. Going to try this.